The silky anteater has little interaction with other species because it is arboreal and nocturnal. It sleeps wrapped in a ball in the canopy of the forest all day, in silk-cotton trees because these trees provide camouflage (Catchpoole 2012). It is active between 15 minutes after sun set up to a couple hours before dawn (Hayssen et al. 2012). The silky anteater is an insectivore. It mainly interacts with ants, eating between 700 to 5,000 a day from a variety of genera, including Camponotus, Crematogaster, Dolichoderinae, Pheidole, Procryptocerus, Pseudomymex, Solenopsis, and Zacryptocerus. It also eats some bettles as it is an insectivore. It uses its sharp claws on its front paws to open a branch and then proceeds to scoop out ants with its tongue (Hayssen et al. 2012). Its diet makes C. didactylus a secondary consumer. Some natural predators of the silky anteater are the tertiary consumers hawks and eagles (Schober 1999). If you would like to learn more about C. didacylus's defense response, please check out Form and Function. They also avoid predators by living in Ceiba trees because the trees have large silky pods that the C. didactylus can use for camouflage (Schober 1999). C. didactylus is also susceptible to several parasites, for example the Amblyomma humerale (a tick), the Eimeria cyclopei (a unicellular Alveolate), and a few nematodes (Graphidiops cyclopi and Cyclobulura lainsoni). These parasites can lead to morbidity and mortality. Cyclopes didactylus can also host the virus for yellow fever (Hayssen et al. 2012). C. didactylus also interacts with members of its own species when it mates. The father often carries the offspring on its back while it moves around. Also, the mother leaves the young about eight hours a night to forage for food (Hayssen et al. 2012). The mother and father also feed the offspring with regurgitated insects that are semi-digested (Schober 1999). For more information, please see our Reproduction page. To learn more about their food habits, please visit this webiste. While it is on the endangered list, C. didactylus is considered “least concern” although the small separate population in northeastern Brazil is threatened by sugarcane production (IUCN Red List of Threatened Species 2013). If you would like to learn more about its endgangerment, please visit the International Union for Conservation of Nature and Natural Resources website. It is often protected by its own behaviors of being nocturnal, very small, and living discreetly in trees (Hayssen et al. 2012). C. didactylus also requires very little sustenance to live. In a study performed in Panama during the dry season, its food, water, and energy requirements were only one-third to two-thirds of the expected values for a mammal with its body size (Nayga and Montgomery 2012). This allows it to live in many different areas of Central and South America with forests. 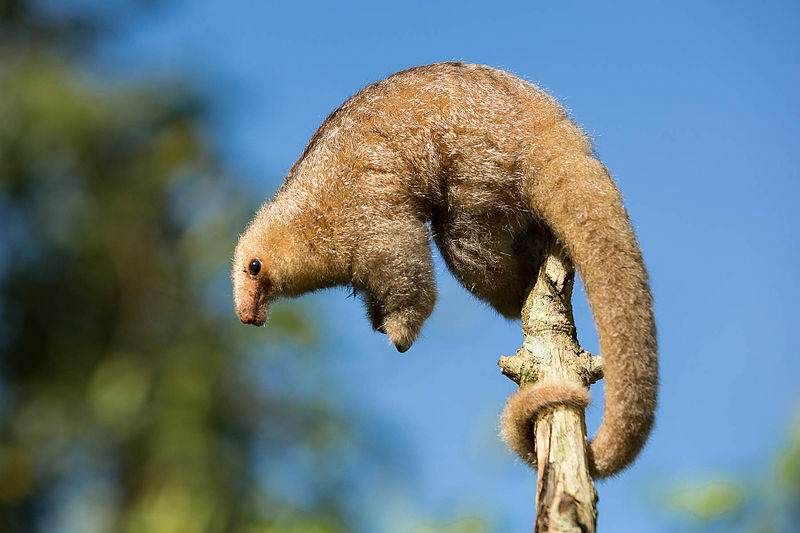 Go learn some Fun Facts about the Silky Anteater!